South Africa, as a region, was colonised by the Dutch, and later, the British. It was not one independent territory, but a patchwork of different territories. The territories included the Cape Colony, Natalia, Transvaal, and the Orange Free State. The Cape Colony was centred round Cape Town, and was established by the Dutch in 1652, but then occupied by the British in 1795, when The Netherlands was occupied by France during the French Revolutionary War. The British where very interested in the Cape, as it provided an excellent way point for ships on the run from Britain to Australia, and India. It consisted of the bottom third of what is todays South Africa. 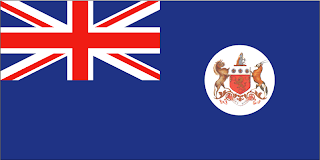 The Cape had a British Blue ensign, and charged with the Cape's coat of arms in the fly. The coat of arms consisted of a lion on a red shield. The lion is a South African animal, as well as being part of British and Dutch heraldry. The supporters for the shield are also South African animals, a Wildebeast, and Oryx. And all topped with the "Lady of Good Hope" holding an anchor. 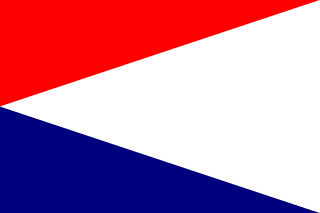 Natalia was established by the Dutch Boers in 1839, and adopted a flag that had large similarities to the Dutch flag. Consisting of a white isosceles triangle from the fly, and the top and bottom of the flag are red, and blue. Similar to the Dutch flag. However, the British annexed the territory in 1843, and flew the Union Jack over its new territory of Natal. After breaking away from the British, the Boers established an independent nation, the Orange Free State. This was not Dutch, but totally free. This republic lasted from 1854, to 1902. 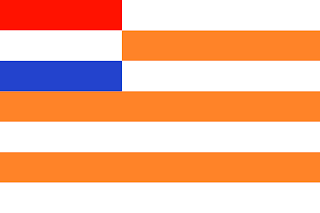 The flag borrowed heavily from the Boers Dutch heritage, featuring orange and white stripes, then in the upper hoist canton, the Dutch tricolour. This flag was adopted in 1857, 3 years after the Orange Free State was founded. Another independent territory was the Transvaal. This territory was colonised by Boers who left the British controlled Cape Colony. The Boers migrated from the Cape on what was known as The Great Trek, leaving British controlled land, unhappy at British rule, especially with regards the British ending slavery in their colonies. 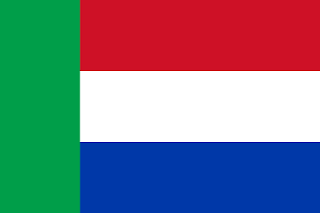 The Transvaal flag took the Dutch tricolour, but had a green stripe laid vertically along the flags hoist. The flag became known as the Vierkleur. The 4 colours. In the late 1890's the area broke out in the Boer War, which raged until 1902. 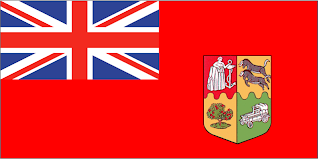 After the war, the British annexed all the Boer controlled territories, and after the war, the new South African colony adopted a red ensign, charged with a new coat of arms. Each canton features an image representing each of the 4 territories. The territory was united as the Union of South Africa. However, debate raged about who controlled the new union, and what emblems should represent the new Union. The Boers wanted Dutch based emblems, whilst the British wanted British based emblems. Finally, in 1928, they opted for a temporary flag. This temporary flag took the old Dutch tricolour of orange, white, and green. In the central white stripe, they added 3 flags to represent the territories history. 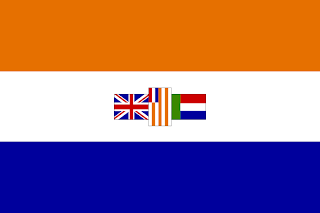 The Union Jack, and the flags of the Transvaal, and the Orange Free State. This flag became known as the Prinsevlag. This flag remained as the flag of the Union of South Africa, then when the Union gained its independence, and on into the the 60's when they opted to become a Republic. In the 1970's, there was a consultation about the creation of a new, clean flag. This took the orange, white, and blue, and turned them into a vertical tricolour, with a springbok placed in the centre. However, this idea never left the drawing board. As part of the negotiations to move South Africa from apartheid, the flag was discussed, and after 7,000 entries in a competition, none of then encouraged a lot of excitement! So, in 1993, an interim flag was designed for the new multicultural elections, and for Nelson Mandela's swearing in as president. 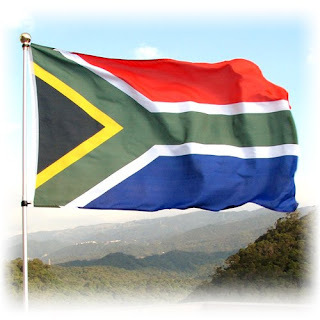 This flag then became the flag of South Africa, and was finally finished with intense negotiations between the ANC and the government of the day, and with just weeks to spare before the new constitution came into force. The new flag has a green Y shaped stripe, starting from the two corners on the hoist, and merging into one in the centre. This is to represent the merging of the various factions in South Africa, and heading into a united future. The y shape is fimbriated in white along the top, and bottom, and in yellow towards the hoist. On the hoist is a black triangle, and above the green stripe, is red, and below, blue. There is no symbolism attached to the colours, other than the black, green, and yellow come from the ANC, and the red, white, and blue comes from the flags of Britain, and the Netherlands. Though, the Anglo African community would have preferred a plain red, and the Afrikaners would have preferred orange.